White buffalo-calf-woman - hilf-mutter-erdes Webseite! In 1890 this white buffalo calf was born. In this year, the Native Americans were forced to abandon their path of freedom and spirituality, because they were forced into reservation and they nearly became extinct. 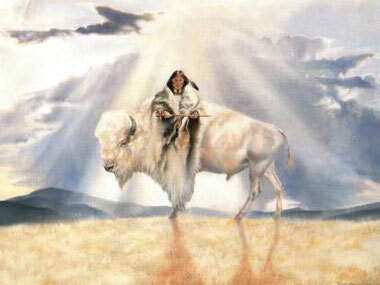 In 1994 a white buffalo calf was born in Nevada (USA). Since this time, Native Americans started to live their spirituality again. The old ceremonies are practiced again. Since 1976, Native American have their freedom of religion again. In the summer of 2000, four white buffalo calves were born in four different places in North America. These calves were hidden and protected in changing places, because there were orders to kill these calves. In the summer of 2004, the four white buffalo calves were safely released into freedom. Exactly at the beginning of the first Help-Mother-Earth-gathering in Wolfratshausen (D) on Monday, the 30th of May 2018 a white buffalo calf was born in Europe! The first European white Buffalo was born at the Zoo of Belgrade/Serbia. A symbol of hope!